The IET is a registered agent for several Australian universities. As an agent we are there to provide you with all of the information, support and guidance you should require about our partner institutions. Many of our students have studied abroad and credit IET's successful IELTS training and agency help as the reason they were successful in their applications. The IET keeps in regular contact with its alumni, and always enjoys hearing how successful IET alumni have been both in Mongolia and around the world. Would you like to find out more about any of our partner institutions? Contact Us! Built on the principles of equity, excellence and engagement, the University of Newcastle has a reputation as a world-class institution making an impact throughout Australia and across the globe. Despite being less than 50 years old, it is ranked amongst the top three percent of universities world-wide. To visit the University of Newcastle website, click here. Their English Language Centre has established a reputation for excellence in English language education, nationally and internationally. To find out more about the English Language Centre, click here. So what is it like to go to Newcastle? Hear from one of our students! 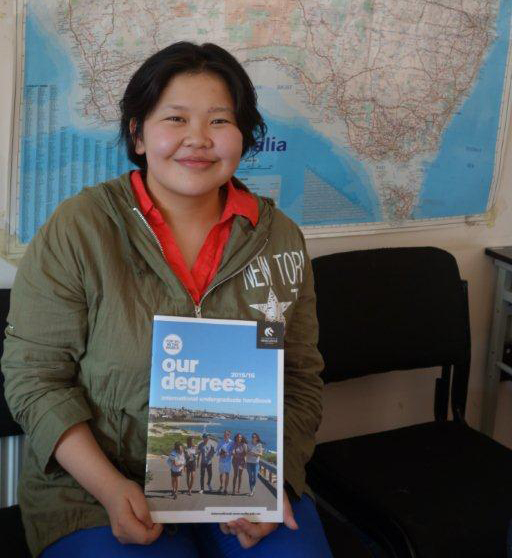 "I firstly want to go to Newcastle to improve my English skills and secondly, I want to continue my studies there and successfully start a Bachelor of Medicine to become a doctor. Going to Newcastle is the first step for me. I am most looking forward to seeing the University of Newcastle and the beach! I am so happy with the help I received from IET, they gave me the guidance to help me follow my life goals!"